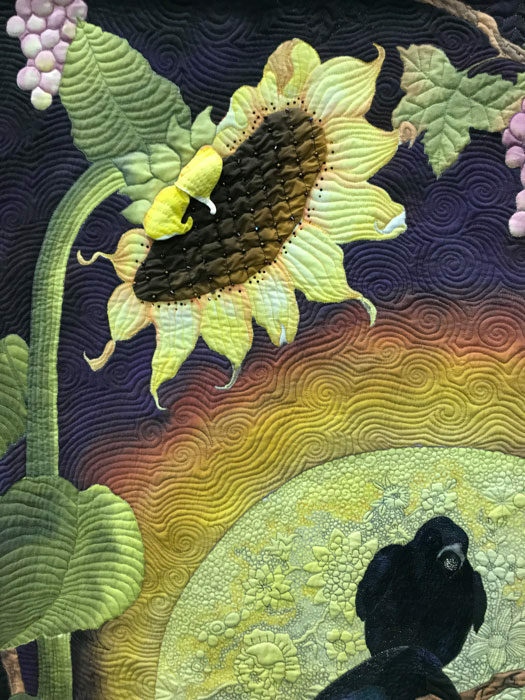 The last two weeks of September were filled with judging three quilt shows in succession with wonderful quilts in each. 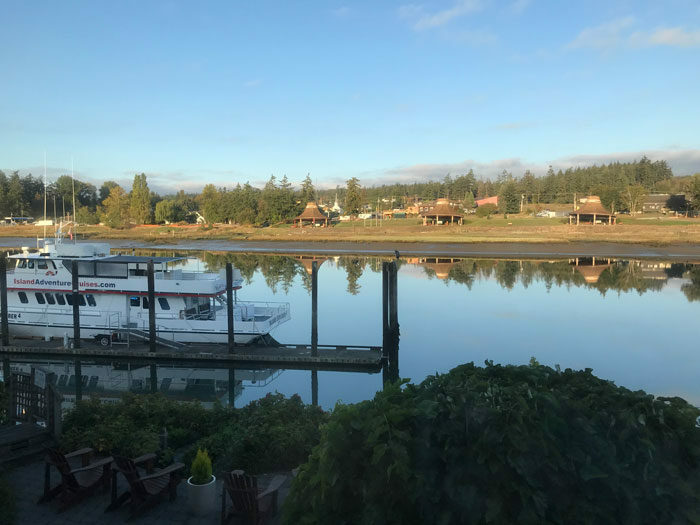 The first show I judged was in La Conner, Washington located on a channel of the Swinomish River. 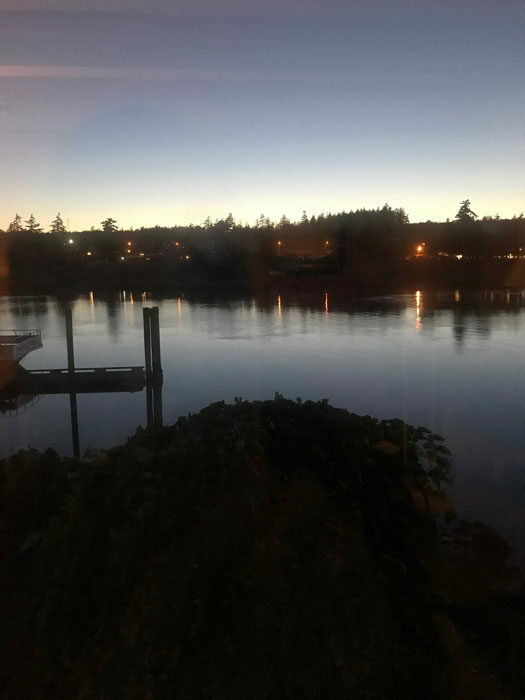 I was lucky enough to have a room at the Channel Lodge with a beautiful view of the water. 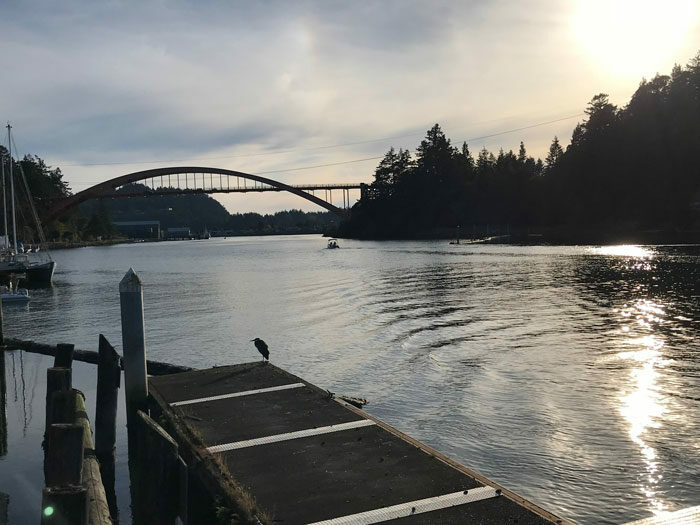 I had beautiful morning and evening views of boats, birds, and bridges. 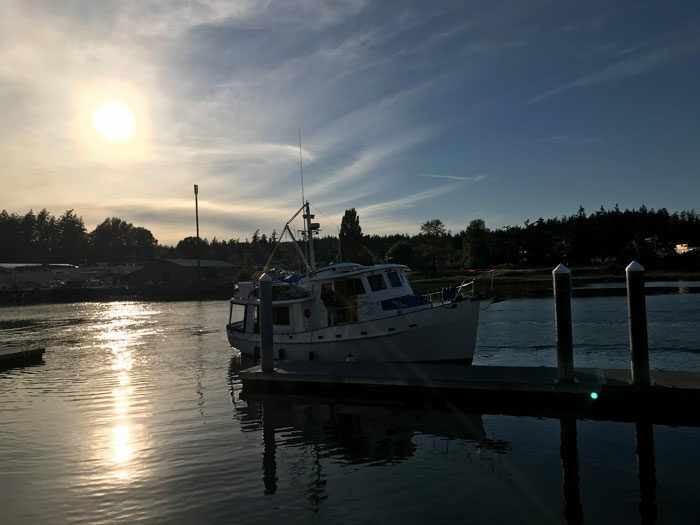 La Conner is an historic town full of great restaurants and charming shops. 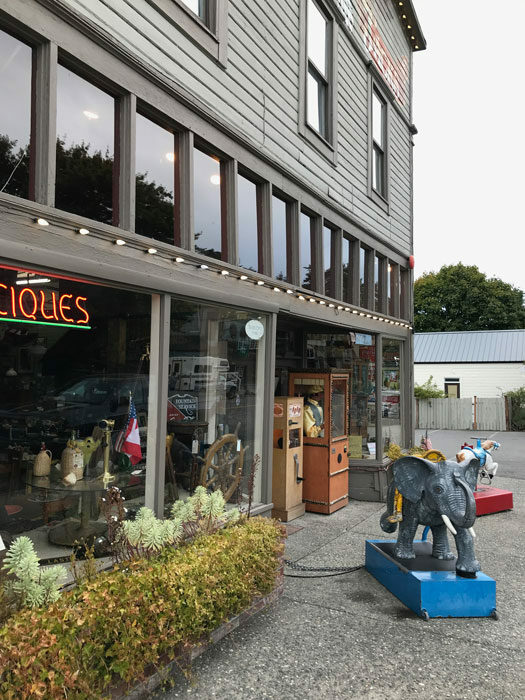 Here’s Nasty Jack’s Antiques filled with all sorts of retro and vintage items. 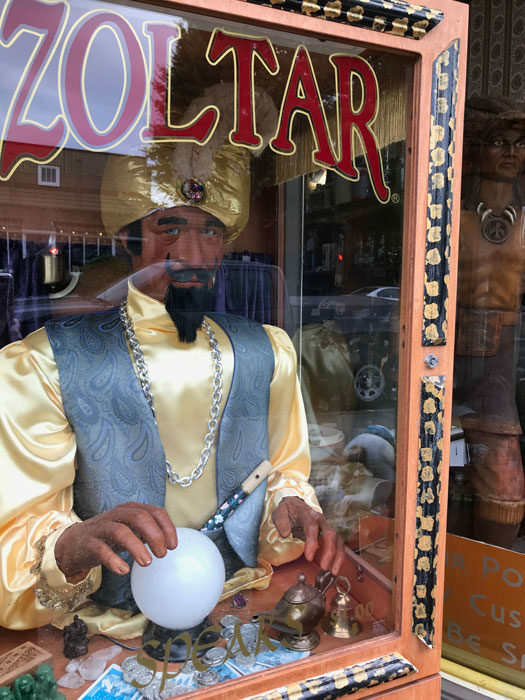 As you approach Nasty Jack’s, Zoltar, the fortune teller, will call to you to come closer. It’s a bit startling until you get used to walking by. 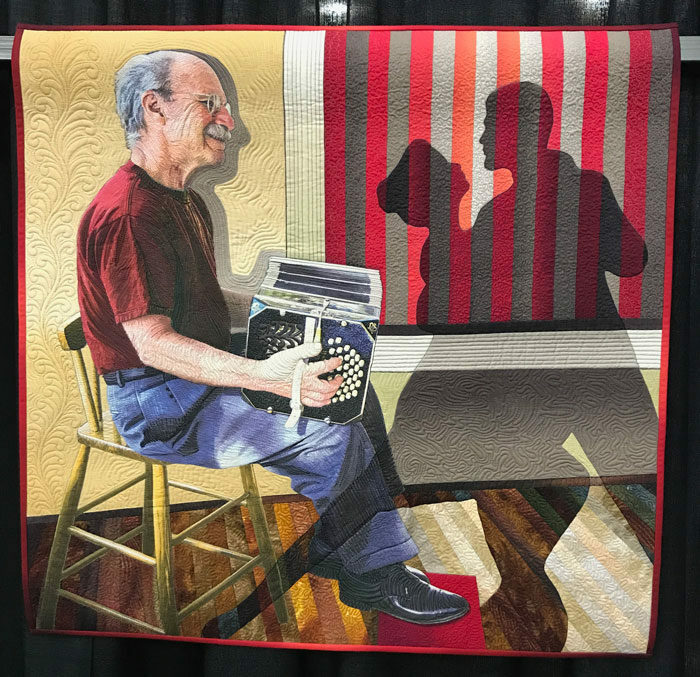 I would love to post photos of the winning quilts and fiber artwork, but the show is not until October 12 – 14th at the Edward D Hansen Conference Center in Everett, WA. Note the change of venue from La Conner. 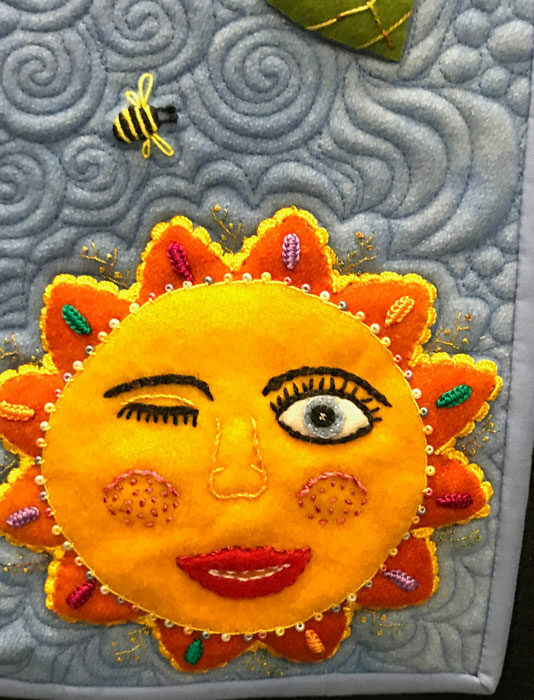 In the past, the show has been at the Pacific Northwest Quilts and Fiber Arts Museum but the venue has changed in an effort of offer easier accessibility and parking. You will not be disappointed if you attend the show. 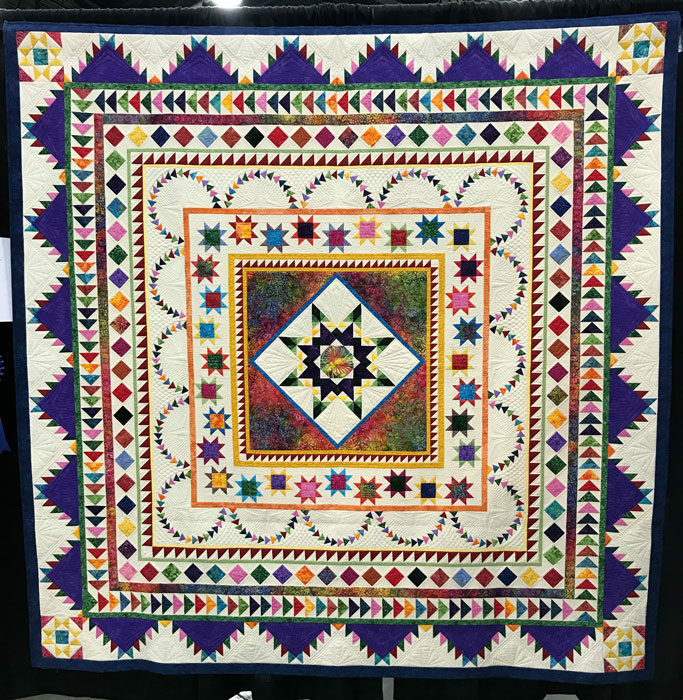 The best of show is stunning! 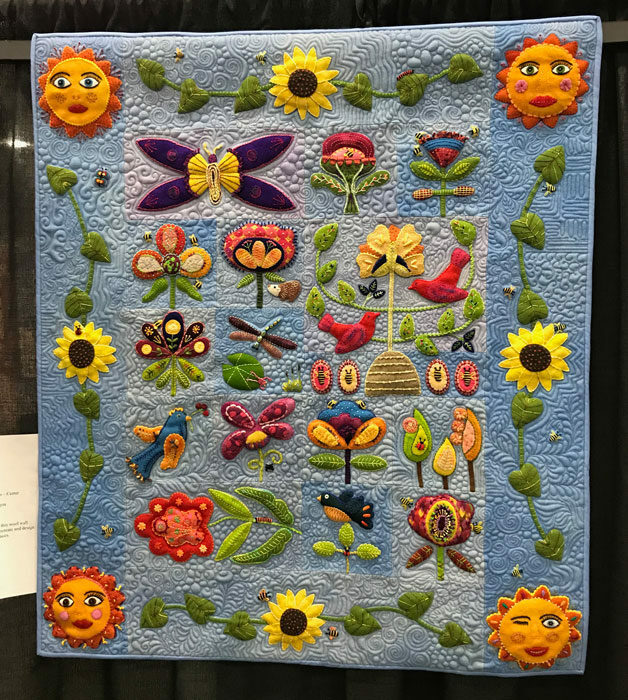 Next I judged the Northwest Quilting Expo here in Portland, OR. Talk about stiff competition in several categories. Pictorial had 55 entries alone! 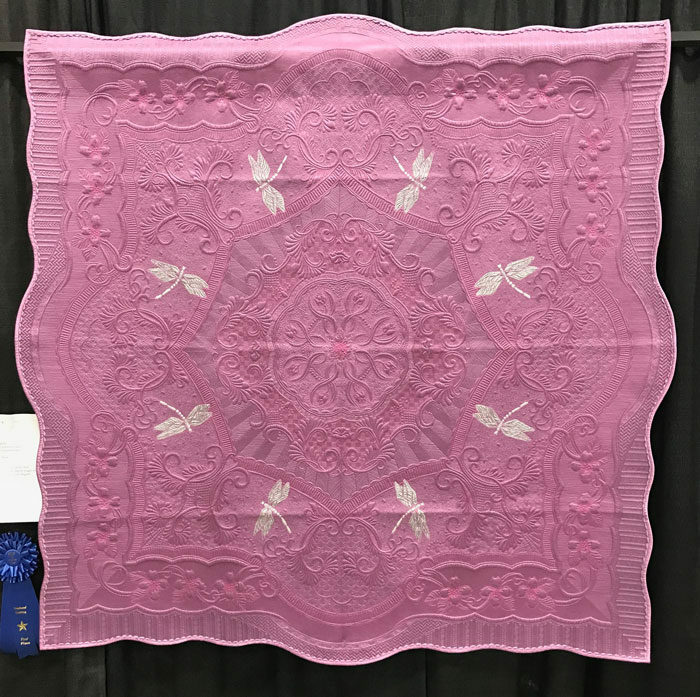 Fellow judge Elizabeth Spannring and I deliberated at length over best of show with a number of great first place category entries to choose from. Ultimately, we chose “My Secret Garden” by Margaret Solomon Gunn. 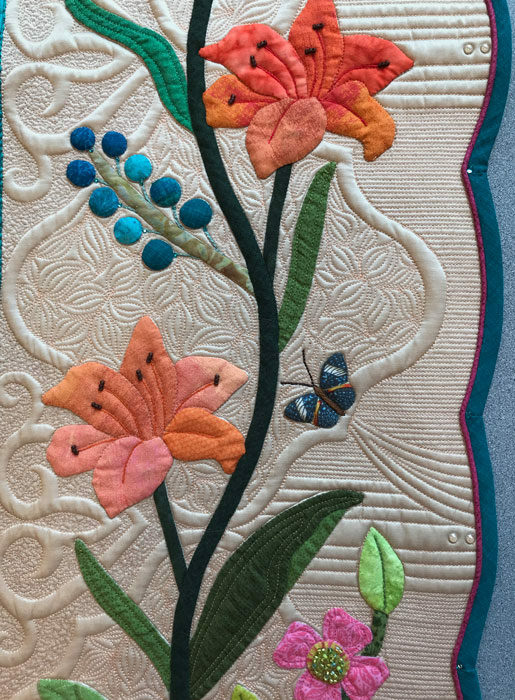 Here’s another first place in its category by Solomon Gunn titled “Ode to Spring.” She has a very recognizable style. 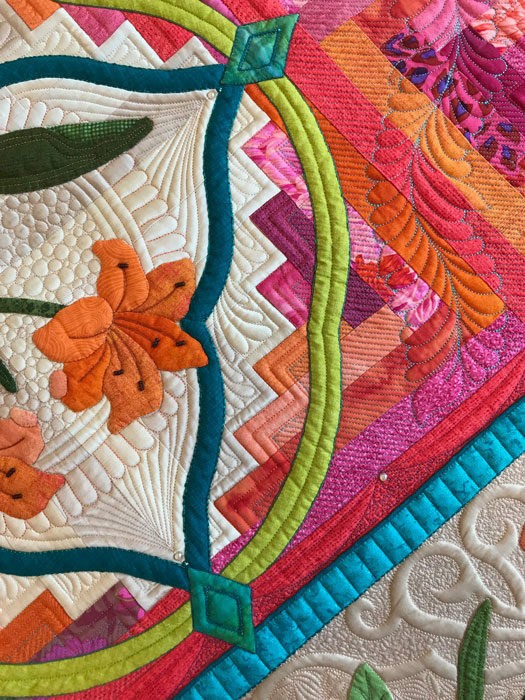 Here are just a few of the other judged quilts that I found successful for various reasons. 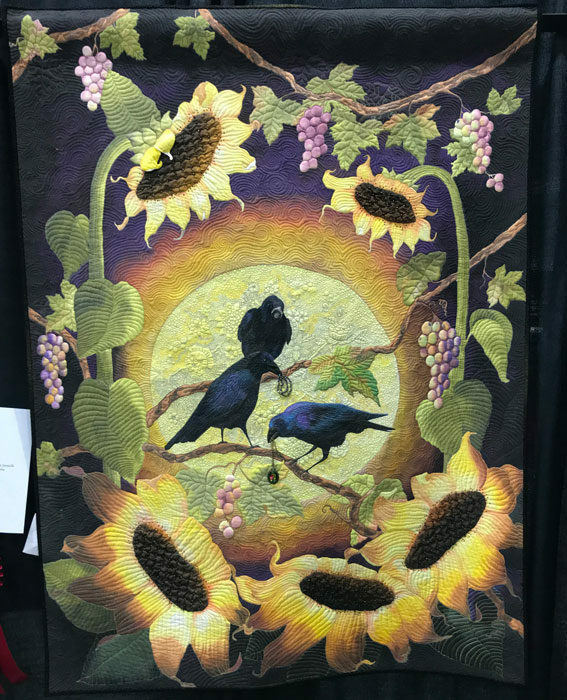 Here is my Judge’s Choice by German quilter Birgit Schueller. Somehow I missed the title, and I can’t locate it on her website. 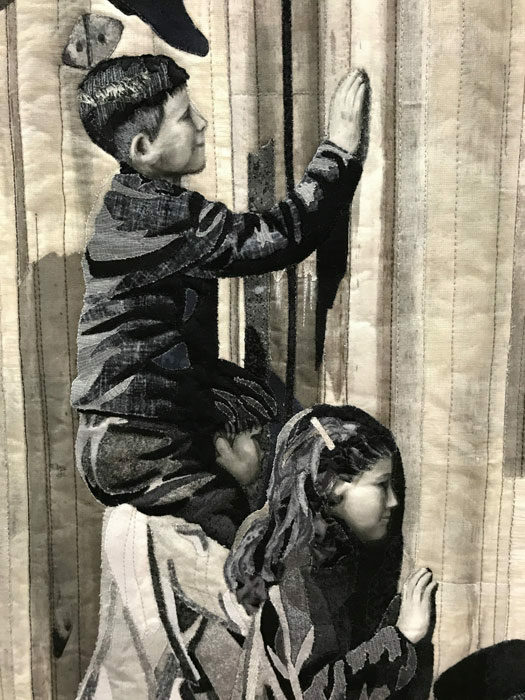 This first place winner is by Sharon Engel. 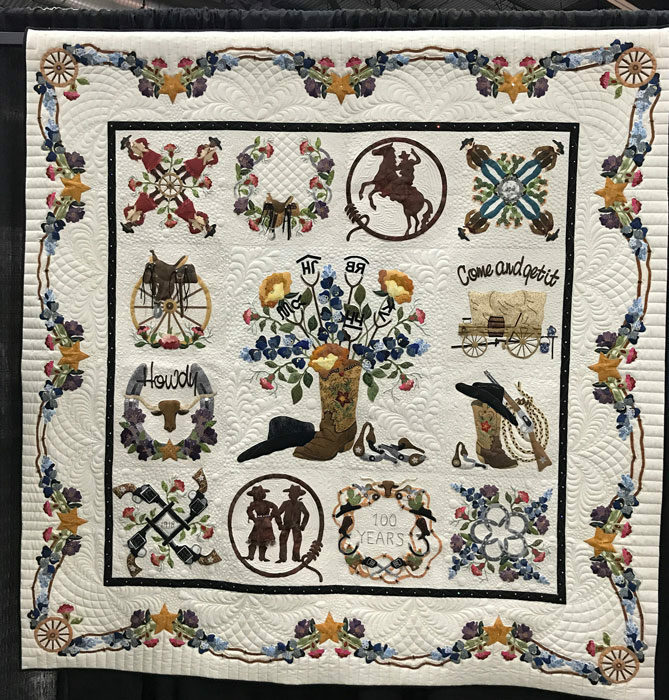 I appreciated this western take on a Baltimore Album in this quilt titled “100 Years of Moffat County Fair”. 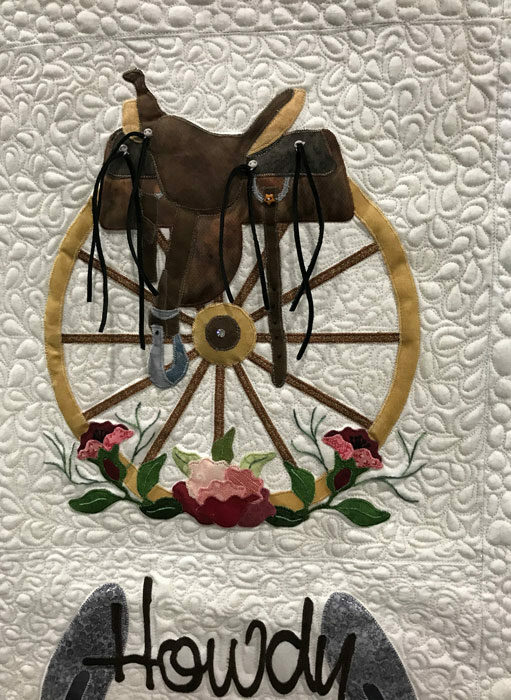 Note the saddle fringe and creative wreaths made of six-shooters and horse shoes. 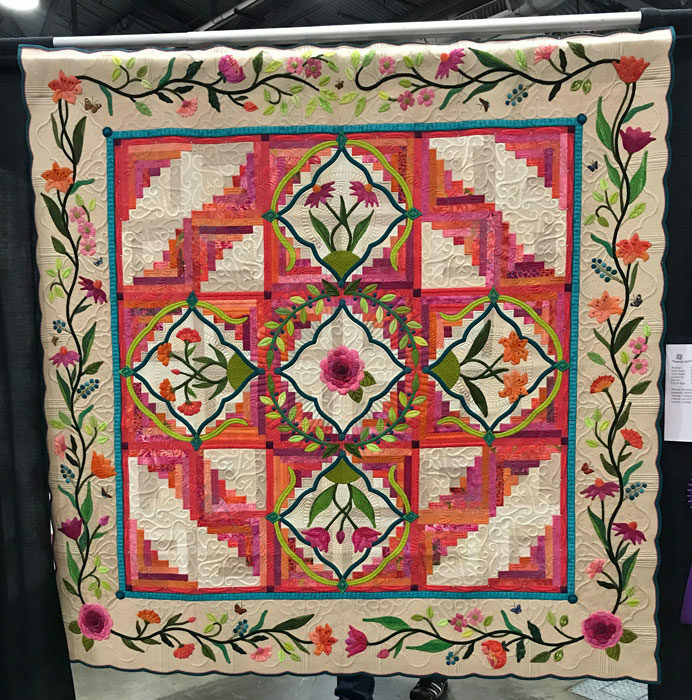 Gayle Pulley is one of my favorite quilters. 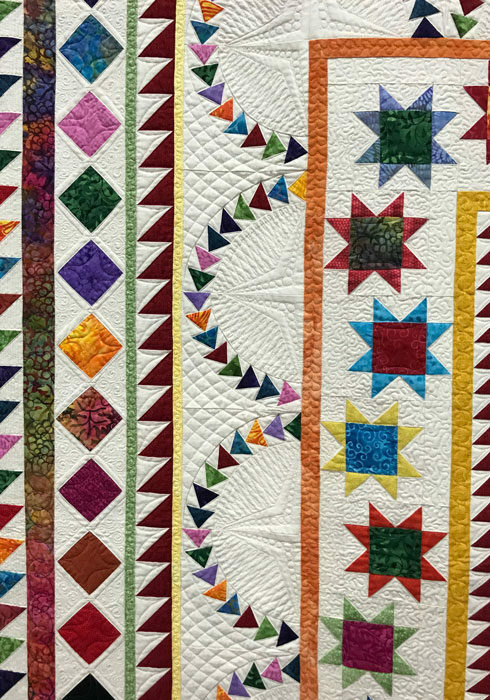 I own one of her auction quilts from the now defunct Association of Pacific Northwest Quilters. 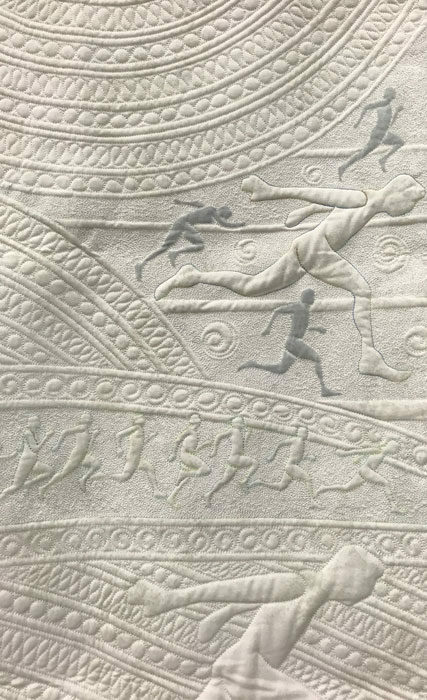 I was asked to select my favorite whimsical quilt. 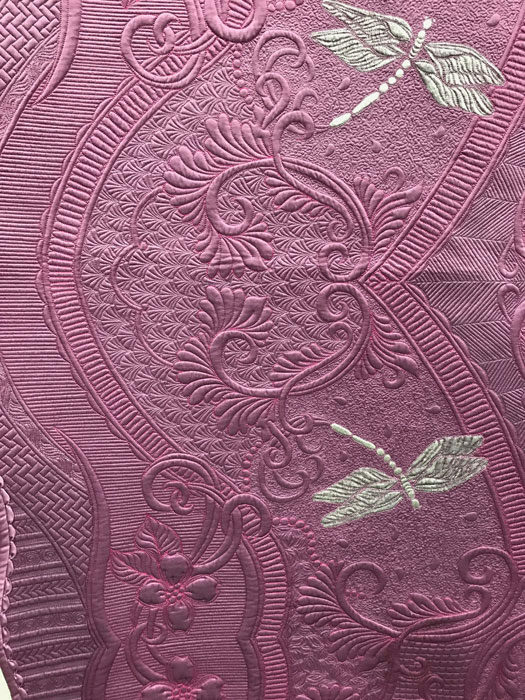 I chose this one for great texture and detailed embroidery. 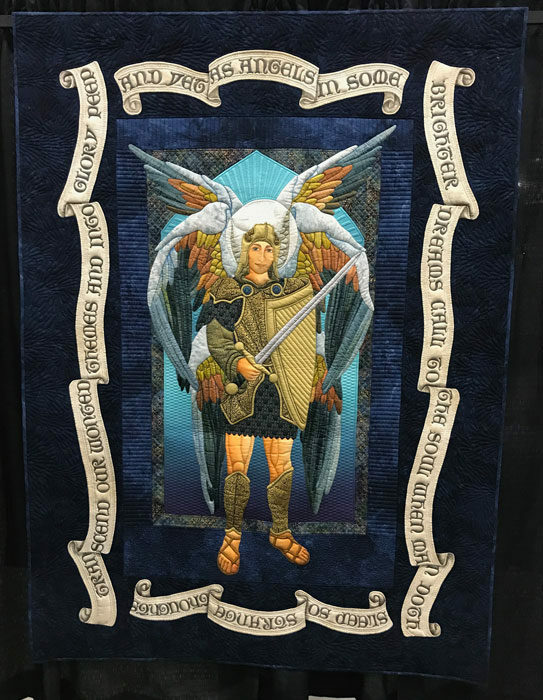 “Bright Angel Be My Guard” features amazing surface design techniques in the figure’s face and body. This was a third place winner in its category. 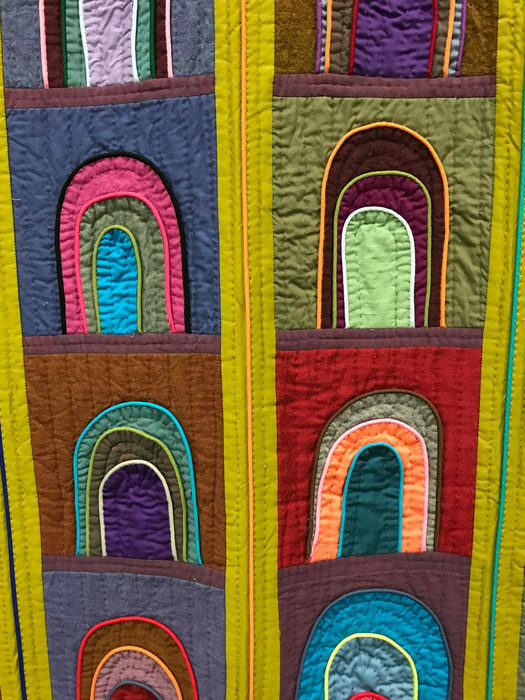 There were two special exhibits with quilts I really admired. 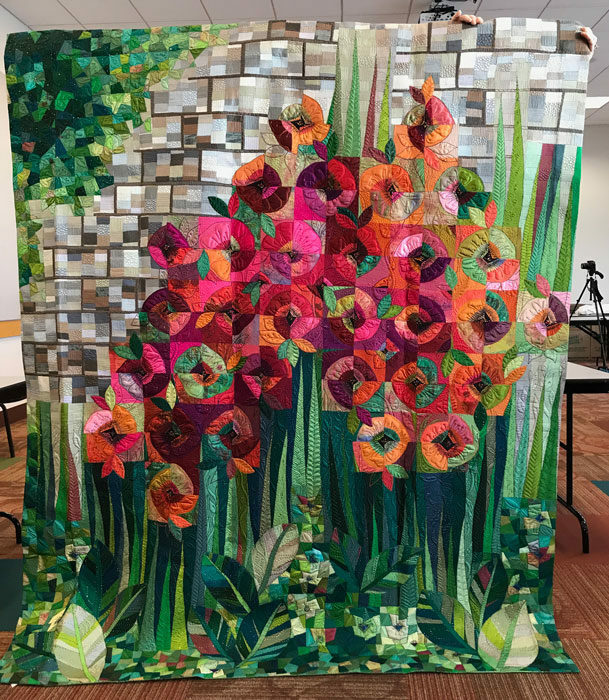 The first was by the Contemporary Quilt Art Association of Washington state. 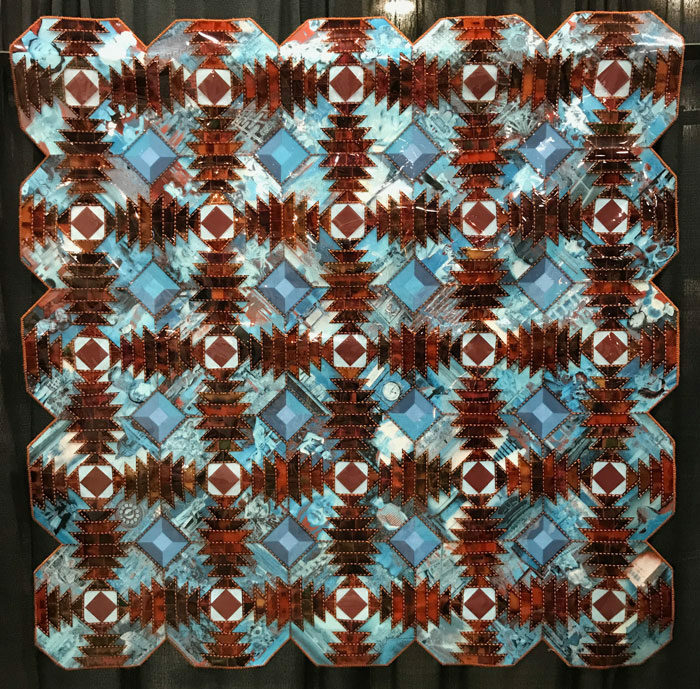 This fabulous piece is constructed of film negatives and overhead projector sheets. 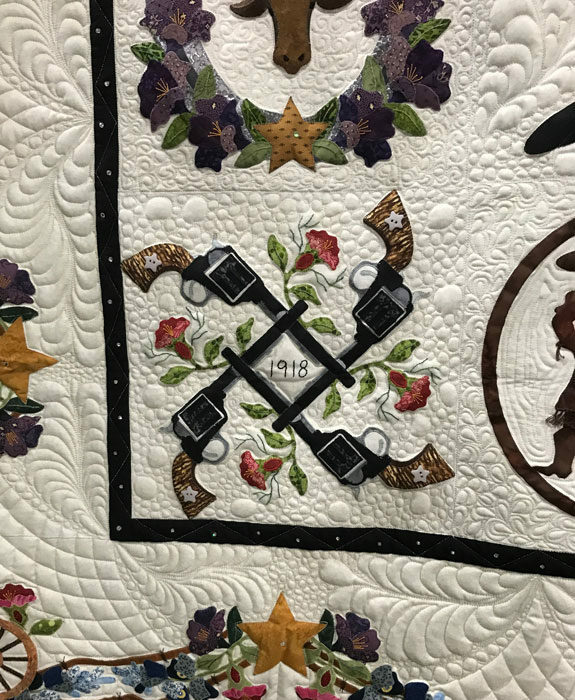 I love the story the quilt below tells. 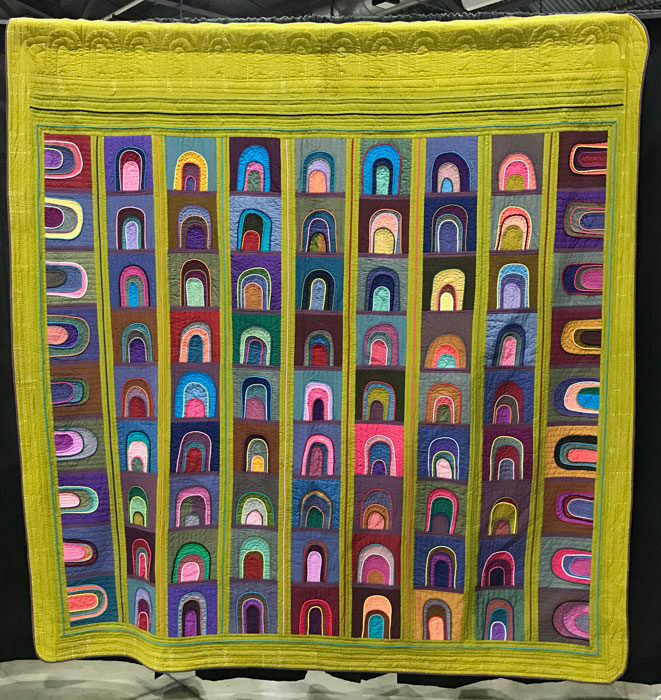 The second special exhibit features the work of a small group called The Storytellers whose theme for this exhibit was “Cities”. 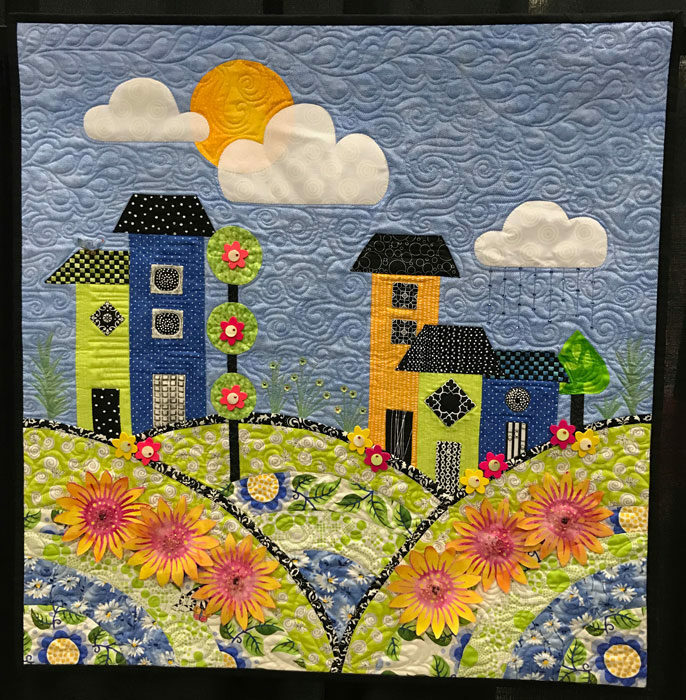 This quilt by Linda Reinart has great charm. The wall hanging below is really creative. 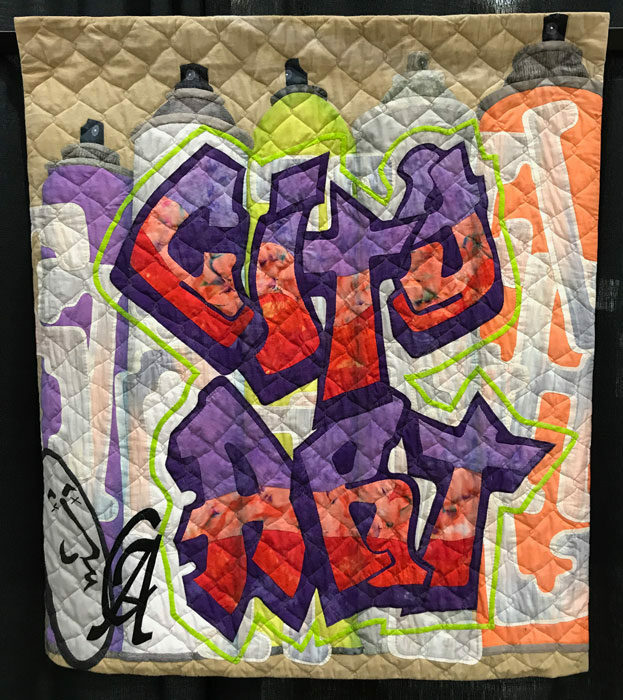 Notice the spray cans used to paint the graffiti, and my favorite part in the lower left-hand corner, where CarolAnne signed her name in graffiti style. Judith Phelps had three great contributions to the group’s exhibit. This first one, the second place winner in its category, is titled “E. Burnside and Sandy Blvd, Portland, OR”. Judith used a vintage photo as her guide to this well-known neighborhood, giving a nod to the original image with the corners commonly used in photo albums. 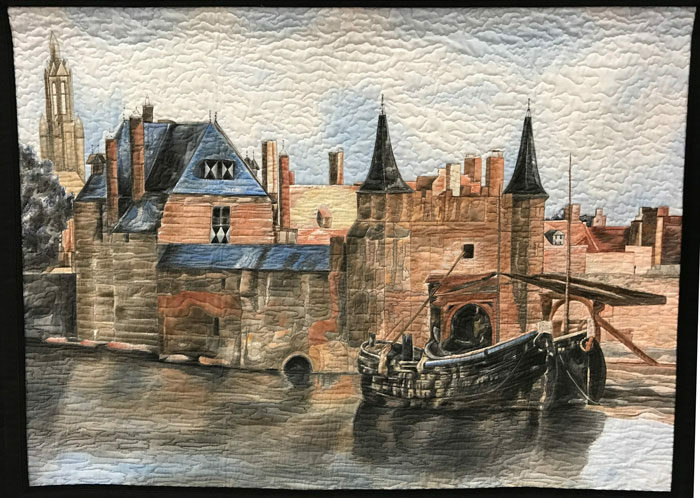 Judith painted the following wholecloth quilt then quilted it. The soft palette really sets a mood. 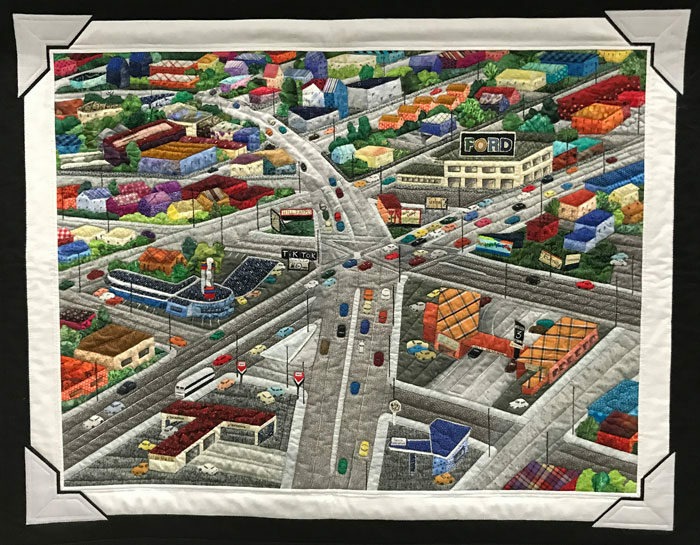 The third quilt also pays homage to the city but one of yesteryear when Portland had a baseball diamond between 1901 and 1956 on Vaughn Street. 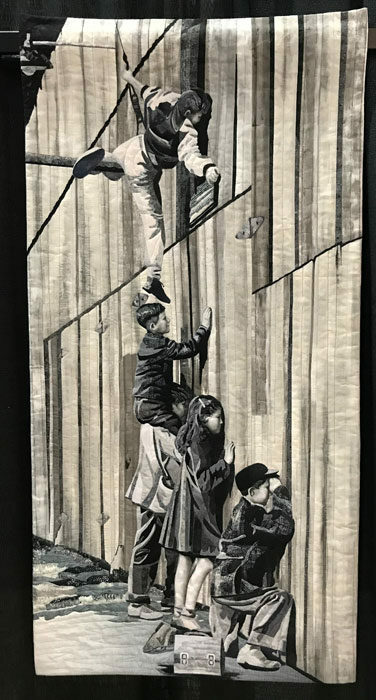 The piece is appliquéd with the faces and hands painted. 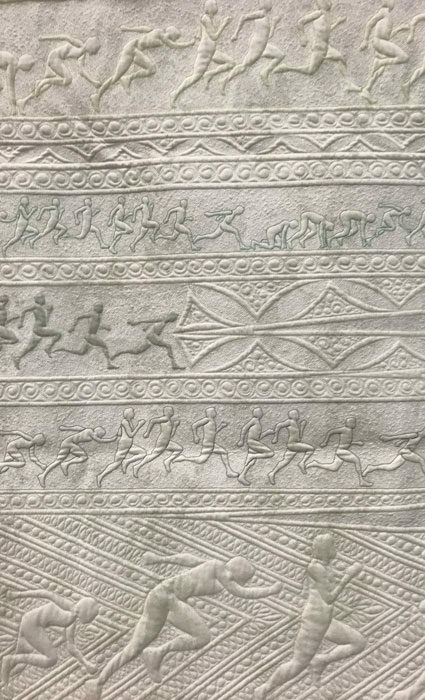 Note the great use of value and shading. 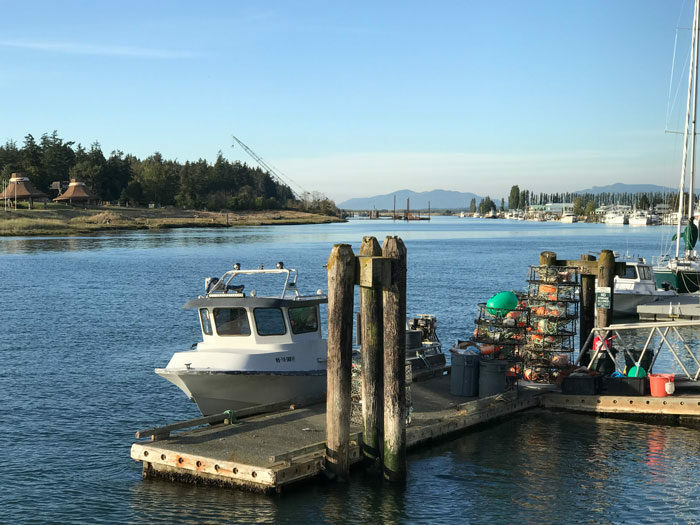 Given the lengthy nature of this post, look for one to follow on the rest of the Portland show and that in Boise. More to come!